Beat the rush and lock in your CalBal 2020 pass at the 2019 pre-purchase price of $225 (the average pass price paid in 2019 was $227!) 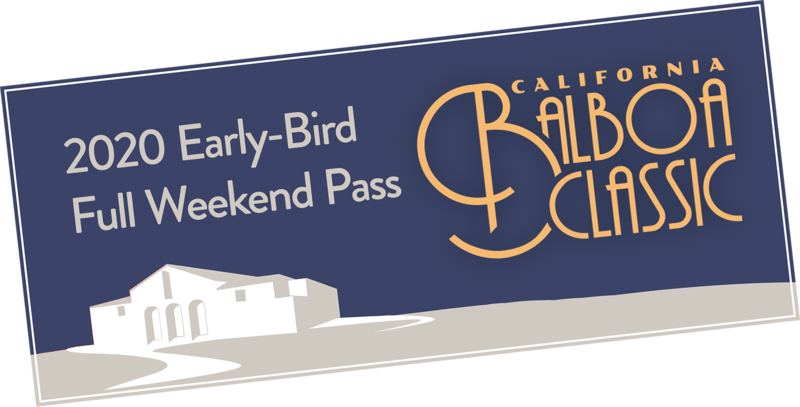 These limited-quantity, early-bird passes are fully transferrable and may be used to pay for a full-weekend pass after CalBal 2020 registration opens in August, 2019. Early bird pass sales end on Feb 6, 2019 or when passes are sold out. Early-bird registration is closed. Regular registration open August 14, 2019. Stay up-to-date: follow us on Facebook and RSVP for 2020! CalBal 2019 was completely sold out—in fact, we sold 872 passes, exceeding our “sell out” target by almost 100. CalBal will be back January 17–20, 2020 at the Hyatt Regency, Newport Beach with more incredible bands, DJs, classes, and competitions. Between now and Feb 6, 2019, we will sell up to 250 early-bird pass vouchers. Purchasing an “early-bird pass” entitles you to a single, one-time use voucher which may be transferred to anyone prior to December 31, 2020. Once the voucher is used to purchase a pass, all normal pass transfer rules apply (see below). When you purchase this early-bird pass voucher you lock in a full-weekend pass for $225—your price cannot go up as long as you redeem your voucher before January 20, 2020. Your voucher code will be sent to you approximately one week prior to registration opening on August 14, 2019. After January 20, 2020, vouchers are non-refundable and non-transferrable. A full-weekend pass entitles you to 12 hours of classes, 30 hours of social dancing–including 7 hours to live music—as well as access to lunchtime talks, Friday electives, and our discount hotel room block. All rules are subject to change and must be agreed to when completing your pass purchase. All participants, students and observers of the California Balboa Classic must read and accept this liability form before entering or participating at or in the California Balboa Classic Workshop and dance event on January 17–20, 2020. Any registrants under 18 must inform California Balboa Classic of their age and must provide a copy of this waiver signed by their parent/guardian to the workshop prior to participation in any dance, workshop, class, or contest. By submitting my registration, I recognize and understand the risks of physical injury inherent to dance and dance training and I fully assume those risks. I hereby release California Balboa Classic, its operator Pacific Swing Dance Foundation Inc., the Hyatt Regency Newport Beach, all teachers and volunteers at the California Balboa Classic from all liability for injuries sustained or illnesses contracted by me while attending or participating in any dance classes, workshops, contests or social dances. I agree to indemnify, defend, and hold harmless the California Balboa Classic, its operator Pacific Swing Dance Foundation Inc., the Hyatt Regency Newport Beach, all teachers and volunteers at the California Balboa Classic for liabilities, costs and judgments arising from acts of omissions committed by me which result in injury or damage to any person or property. I understand and agree that it is my sole responsibility to safeguard my personal property while attending or participating in any Classes or Dance Workshops. I hereby release the California Balboa Classic, its operator Pacific Swing Dance Foundation Inc., the Hyatt Regency Newport Beach, all teachers and volunteers at the California Balboa Classic from all liability for loss or damage to my personal property while attending or participating in classes or events at the California Balboa Classic. In case of physical injury or medical emergency, I hereby authorize the California Balboa Classic, its operator Pacific Swing Dance Foundation Inc., the Hyatt Regency Newport Beach, all teachers and volunteers at the California Balboa Classic to make necessary arrangements to transport me or my child to a medical treatment facility as necessary. All such transportation and medical treatment will be at my sole cost and expense. By signing below, I acknowledge and represent that I have fully informed myself of the content of the waiver and hold harmless agreement by reading it before I complete it, and I understand that I register for California Balboa Classic of my own free act and deed; no oral representations, statements, or inducements, apart from the written statement, have been made. I further state that I am at least eighteen (18) years of age and fully competent to sign this agreement; and that I execute this release for full, adequate, and complete consideration fully intending to be bound by the same. I further state that there are no health-related reasons or problems which preclude or restrict my participation in this activity, and that I will pay any medical costs that may be attendant as a result of injury to me. The California Balboa Classic, its operator Pacific Swing Dance Foundation Inc., and affiliated photographers reserve the right to use photographs and videos, taken either in class or at the dance event for the purposes of advertising and promoting. Pass refunds and transfers are available until October 1, 2019, less a $25 processing fee. Pass transfers are allowed up to December 31, 2019 less a $50 processing fee. The original buyer of the pass is responsible for the processing fee. NO refunds, transfers, or credits are permitted after December 31, 2019. Pass refund and transfer rules apply only to issued passes and do not affect pass vouchers issued under separate terms.